£100 DEPOSITt Will secure your chosen dates as well as act as a damages deposit. We take bookings for Friday- Friday. Monday-Friday and Friday- Monday Funworks passes are NOT included and will need to be purchased through Haven. 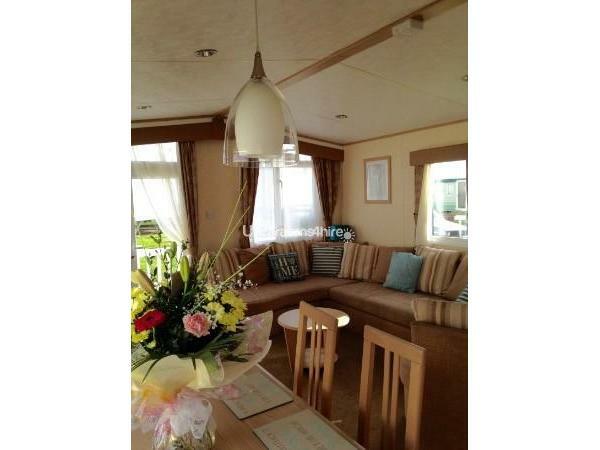 Welcome to our stunning 4-6 berth, 2 bedroom spacious caravan with its own veranda. It has plenty of room being a 12 foot wide model. Our caravan can be found on plot Beachfields which provides a sea view and a lovely patio for those warm summer days and nights. This is a real holiday home, not just a caravan. FULL central heating with double glazing. 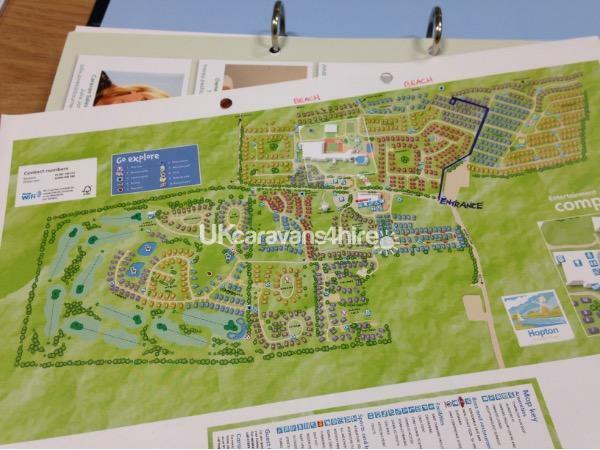 The 5 star award winning holiday village has its very own 9 hole par 3 golf course and we even have a set of golf clubs for you to use to save room in your car. The pool has just has a huge development and looks fantastic. 32"TV, Nintendo wii with games, sound bar with Bluetooth and aux cable connectivity, DVD player with plenty of DVDs, plenty of seating space on our wrap around couch, dining table and patio doors leading on to the front veranda. 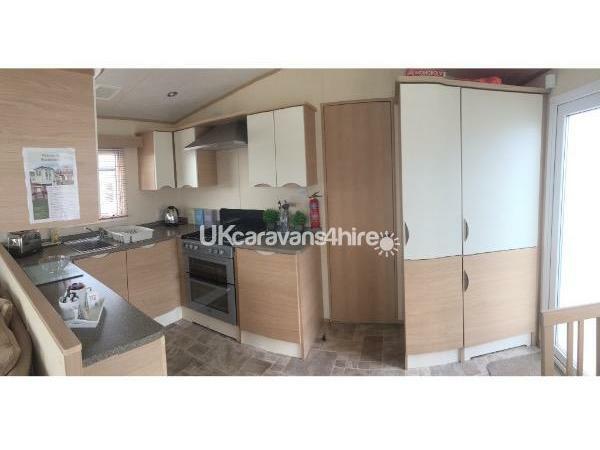 FULL SIZED FRIDGE/freezer, Microwave, oven, hob, extractor fan, kettle, toaster, iron and board, Saucepans, Pyrex dishes, crockery, cooking utensils and cutlery, and basic cleaning objects. 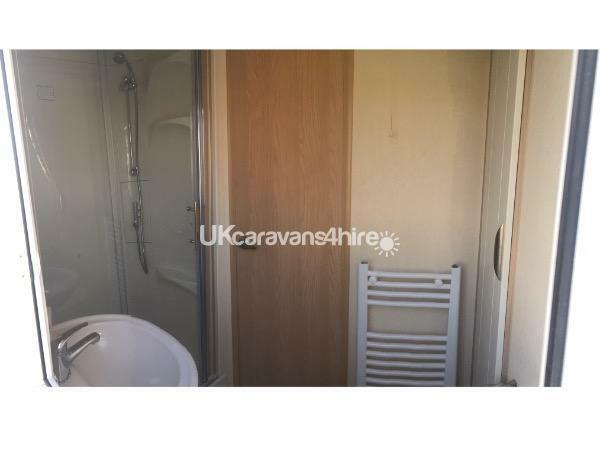 Large Shower cubicle, towel rail, storage cupboard, WC, and wash basin. King size bed, dressing table with large mirror, 26" flatscreen TV, 2 double wardrobes with various drawers and cupboard space. This room would easily fit a travel cot if necessary. EN SUITE TOILET attached to the main bedroom. 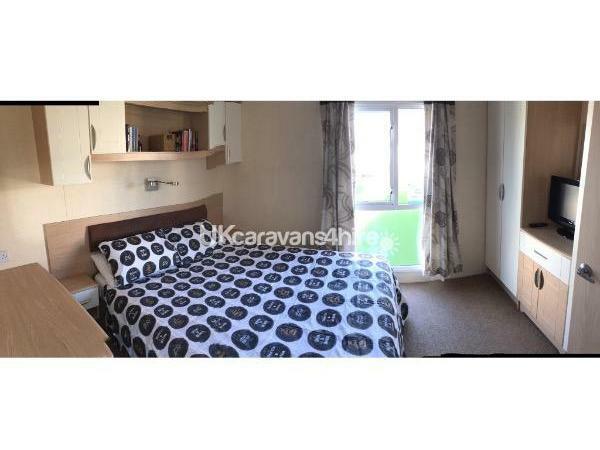 2 single beds, wardrobe and various cupboards, flat screen TV. We have a heavy duty picnic table for your enjoyment and we also have wind breakers ready for you to spend lazy days on the beach. All you need to bring is your linen, towels and cloths. If you would prefer not to bring your bed linen we can arrange for beds to be made up ready for your arrival at an extra cost, please state in your enquiry if you would like linen provided. The blue flag golden sand beach can be accessed via to entry points both equal distance from the caravan,your feet can be on the warm sand and water within 3 minutes. We require a £50 refundable damages/security deposit which will be returned once the caravan has been checked and all is ok.
We have been renting out on Hopton for over 6 years and have many returning customers, please take the time to read our reviews. . Be honest.... what more could you want? A lovely caravan to stay in, it felt like a new caravan, nice and clean, the facilities were just what we needed. It was lovely to be so close to the beach. We had a go on the Nintendo Wii when had some spare time. I even made sure I read one of the many books available. Our daughter watched a couple of the DVD'S if she woke early. We would definitely hire your caravan again as it was great value for money. Great caravan&location, it was like home from home.I would definitely recommend to family&friends. Lovely caravan, with lots of extras (DVDs, Wii, cleaning & tea/coffee on arrival) Debbie & Shaun really friendly & helpful, would definitely stay again. Great, large master bedroom - very spacious. Thank you for letting us use your lovely caravan & making our holiday so enjoyable. Had a fantastic family holiday. Caravan very spacious and comfortable. Very well equipped with everything we needed for a lovely carefree holiday. 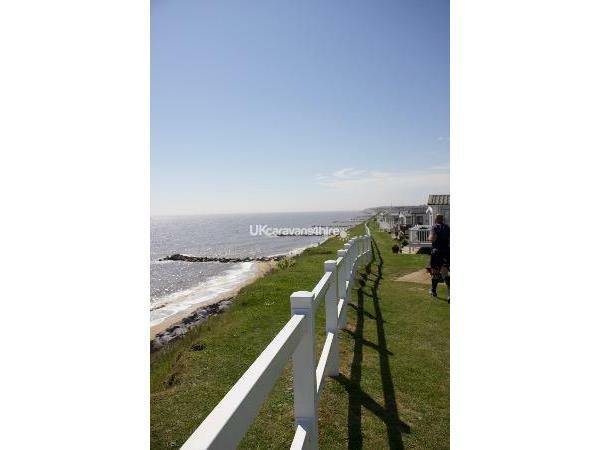 Ideally located just back from the beach front, easy access and a quiet location within the park although only a few minutes walk from all of the excellent on site amenities. Debbie the owner was very pleasant and friendly and was very easy to contact to discuss anything. We booked next years holiday with Debbie whilst driving home!! Thoroughly recommend. Had a great week, Hopton is a great place for kids and caravan is situated in a great position, already talk of booking again next year. I booked this holiday very last minute, called Debbie at 10am Friday morning and was in the caravan for 2pm! The level of help from Debbie was brilliant and she made me feel very welcome in her home. When we arrived I was pleasantly surprised at how clean and tidy the caravan was and with everything how it should be. No issues or problems the whole time we was there. My children loved how close to the beach we was, only minutes walk from the entertainment and shops. So overall this was a lovely weekend away, which we really enjoyed all thanx to Debbie. We will definitely be returning. Had a lovely stay over the Easter weekend. The caravan was very clean and had a good layout. Good Friday was a lovely sunny day so we could enjoy the sunshine on the decking with the furniture provided. My husband particularly enjoyed being so close to beach so I could have a lie in whilst he had a morning walk, he also made the most of the golf course. I couldn't fault the equipment in the kitchen we had every pot and pan you could think of. Debbie was very helpful and I would defiantly book again. 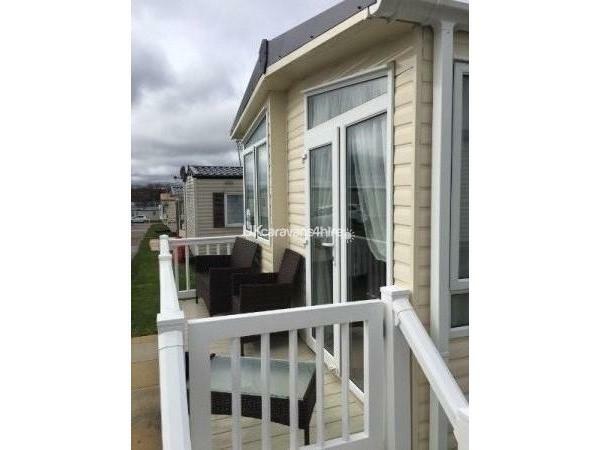 Lovely caravan very well located all you'd need for a family holiday. Will definitely book again. We had a great stay in a great caravan. We have stayed in a number of caravans over the years and this one had everything you could possibly need. It was very clean and tidy with more than enough space. We struggled with the shower initially but once we contacted Debbie and she explained what we were doing wrong, it wasn't a problem, In fact there was a lot more space in this shower room than others and it was great that the toilet is separate. Brilliant holiday in a lovely caravan on a fantastic holiday park. 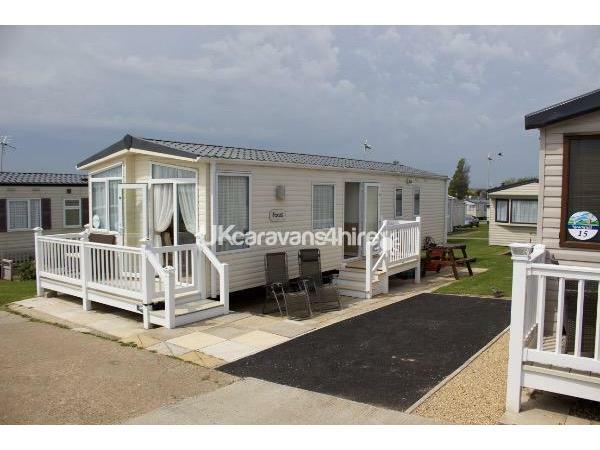 Caravan very clean and well equipped it is in a brilliant location so near the sea. 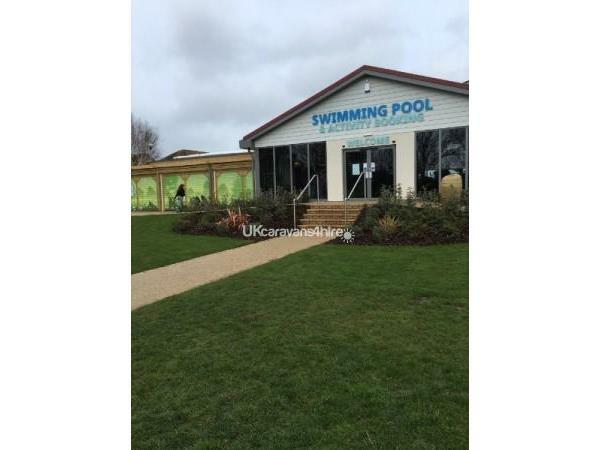 The amenities on the park where of high standard and so much to do for all the family. The owners Debbie and Shaun were very accommodating and couldn't be more helpful. We will definitely be booking again next year. What a lovely caravan very well equipped and clean,lovely and spacious ample room very comfortable as there were three adults plus three children.Very easy to book the owners debbie and shaun were most accomodating will most definately recommend the caravan as a great place to have a holiday and very close to beach,playground and facilities we had an absolutely brilliant time and would book again next year. had a fantastic time with the family.very nice caravan.lovely and clean and well equipped.very easy booking direct with debbie who has been very helpfull.many thanks and will look forward to a return visit. 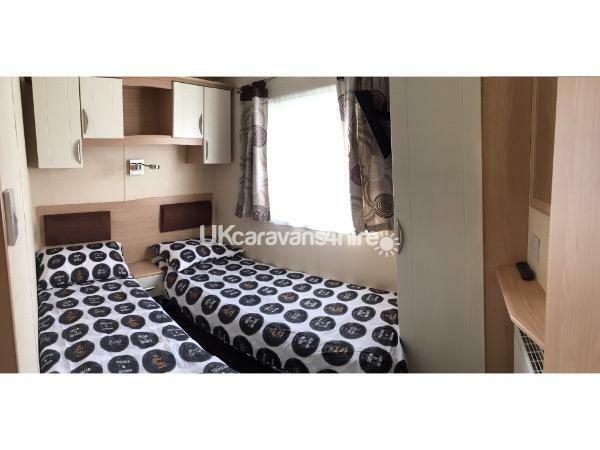 Although not the newest of caravans, it is very clean and well equipped ,with a newly fitted shower. The position on the site is great just a few steps from the beach. 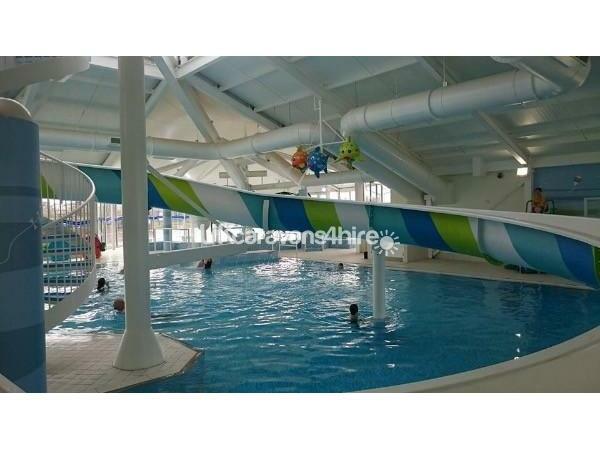 Haven staff are so friendly and helpful and the entertainment is great for children.Would book again. REALLY NICE CARAVAN ON A GREAT SITE. CUSTOMER SERVICE WAS FANTASTIC. NEVER PLAYED MUCH GOLF BEFORE BUT AS THE CLUBS WERE THERE TO USE THOUGHT I WOULD HAVE A GO, THOUROUGHLY ENJOYED IT. Although this is not one of the newest caravans on site it had everything we needed for our stay. It had new carpets and blinds fitted just before we arrived which looked very nice.I gave 9 out of 10 for the accommodation as the shower had a small crack in the base it did not effect its use but that was all we could think of to mention. Booking was made easy, we mainly dealt with Debbie and she was very helpful, looking forward to returning next year.